Welcome to the Warhead Launchpad. Here you will find any resources you may need to help you successfully launch your next Warhead project. 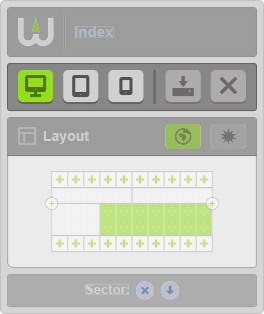 Welcome to the Warhead User Guide - Theme Builder. This user guide contains detailed descriptions of how each and every element functions inside the Warhead Theme Builder. This is where the design and function of every site is created on Warhead. There are varying prebuilt element, or blocks, and css controls built right in, as well as add in any elements that may not be initially built in. A truly blank canvas. To get started with Warhead, simply visit your website url plus /admin or www.warhead.com/admin, log in and start creating. To get started, use the Getting Started document, which contains an index of all the Warhead help documents organized into sections for easy reference. Platform – The Warhead web application runs on Windows 7 or newer, and Mac OS X. Supported web browsers are Chrome 36 or newer, Firefox 31 or newer, Safari 7 or newer, Internet Explorer 9 or newer and Microsoft Edge. Logging In – Warhead requires users to be logged in to access and use the platform and tools. 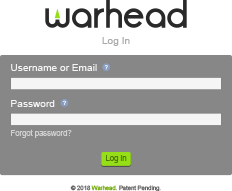 Users can log in with a Warhead Account (created for free). The same account can be used to log in on multiple computers and browsers. Internet Access – Warhead requires an Internet connection to log in and access the platform and tools. Internet access is also required to view any websites that have been created on the platform. Hosting – Warhead websites are hosted in the cloud on Amazon Web Services (AWS). Once a website and content is saved it is stored securely and backed up daily so nothing will get lost. The Warhead Theme Builder is used to create all warhead website designs. The theme builder has many prebuilt blocks and HTML elements that can easily be added to any theme. 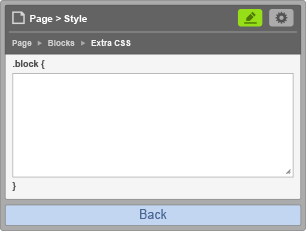 There are also many built in CSS style controls allowing for easy and quick styling of different HTML elements. The possibilities with the Warhead theme builder are endless. 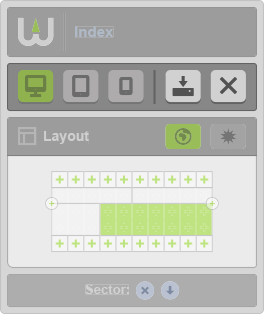 The theme builder is separated into three panels to allow for ease of use and maneuvarabilty if they get in the way. Each of these panels control different aspects of the builder. Moving Panels – Hover over any panel until the move pointer appears. Left-click the mouse and hold while dragging the panel to a new position on the screen. Each panel can be moved independently. 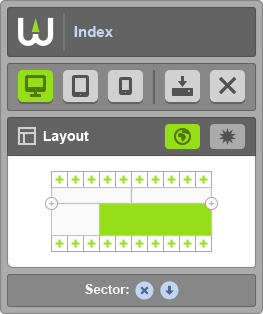 Minimizing Panels – Double click the Warhead “W” icon in the main panel to minimize all panels at once. 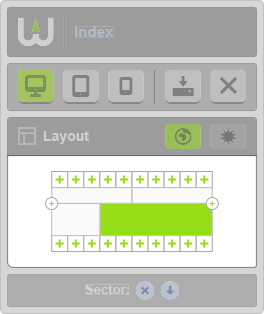 Double click the “W” icon again to maximize the panels. The first and second sub-panels can be minimized independently by double-clicking anywhere in the top portion of either subpanel. Double click the top portion again to maximize either sub-panel. The main panel cannot be minimized independently. 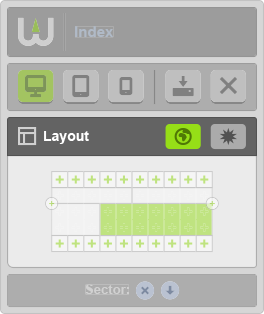 The Warhead Theme Builder Main Panel is where the initial layout structure is determined. Easily adjust and create new rows and sectors (< div >) that will contain the different elements of the website. The ability to navigate quickly to various page in the website is also handled here as well as switching views between Desktop, Tablet, and Mobile versions of the website design. 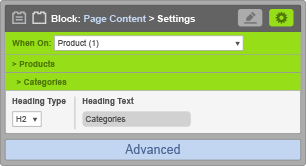 Navigating a ThemeClick the navigation bar to display a list of site pages that are used to identify page layout types and navigate to any page across the entire theme. Click any page link in the list to navigate to that page on the theme being built. The Index page (homepage) is displayed by default. Note: Pages marked with an (*) indicate multiple pages of the same type (ie. there can be multiple Extra Pages like About Us, Contact Us, FAQ, etc.). To navigate to a page that has multiple types, hover over the page type in the list, enter the name of a specific page of that type and click the link to navigate to that page (ie. About Us). Saving a Theme – Click the Save button to display the Save and Save As links. Click the Save link to save the theme and close the builder. Saving a Theme As – Click the Save button to display the Save and Save As links. Click the Save As link and enter a unique name to save the theme under the new name and close the builder. Saving a theme as will save a new copy of the theme and won’t affect the current theme being built. Closing a Theme – Click the Close button to close the builder without saving any changes. Desktop View – Click the Desktop View button to select the desktop view. The desktop view is selected by default. Tablet View – Click the Tablet View button to select the tablet view. Selecting the tablet view will automatically transfer the desktop view blocks and styles to the tablet view. Phone View – Click the Phone View button to select the phone view. Selecting the phone view will automatically transfer the desktop view blocks and styles to the phone view. Delete Tablet/Phone View – Click the Delete Tablet View or Delete Phone View icon to delete the tablet and/or phone view. Deleting the tablet or phone view will also delete any blocks and styles that have been added or customized within those views only. 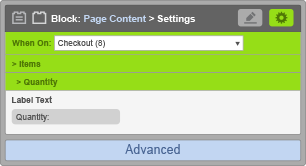 Global Layout – Click the Use Global Layout button to use the global layout for the current page. The global layout is used by default. 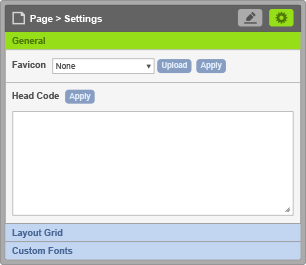 Custom Layout – Click the Use Custom Layout button to use a custom layout for the current page. Any changes made after changing to a custom layout will be unique to that layout and won’t affect the global layout or any other custom layouts being used. Click the Use Global Layout button to go back to using the global layout. Changing the custom layout back to the global layout will delete the custom layout for the current page. Page Type Layout – Click the Use Page Type Layout button to use a custom layout for the current page and all pages of the same type. 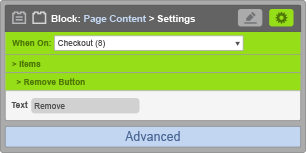 The Page Type layout is available once you set a page Custom. Any changes made after changing to a custom page type layout will be unique to that layout type and won’t affect the global layout or any other custom layouts being used. Click the Use Global Layout button to go back to using the global layout. Changing the page type layout back to the global layout will delete the page type layout for the current page type. Page – Click the area surrounding the layout grid to select the page and view and/or manage page styles and settings in the first sub-panel. Row – Click a Sector in any row to select it, then click the Go To Row icon in the first sub-panel to view and/or manage row styles in the first sub-panel. Sector – Click a Sector to select it. Resize a selected sector by dragging it horizontally across columns or vertically spanning rows. 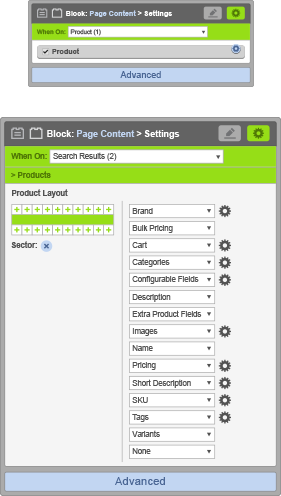 Select a sector to add blocks to that sector and view and/or manage sector styles in the first sub-panel. Hover over any selected or unselected sector to view that sectors width. Add Sector – Click the sector cell icon to add a new sector in an existing row. Add Sector In New Row – Click the Add Sector In New Row icon to add a new sector in a new row between two existing rows. Sector: Delete Selected Sector – Click the Delete Selected Sector icon to delete the selected sector. Deleting a sector will also delete any blocks that have been added to the sector being deleted. Sector: Move Selected Sector Up – Click the Move Selected Sector Up icon to move the selected sector up a row. Sectors can only be moved up if there’s an available sector cell to move it to in the row directly above the sector being moved. Sector: Move Selected Sector Down – Click the Move Selected Sector Down icon to move the selected sector down a row. Sectors can only be moved down if there’s an available sector cell to move it to in the row directly below the sector being moved. 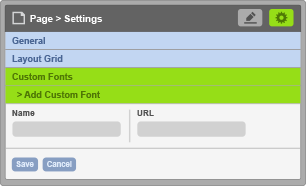 When the page is selected in the main panel the first sub-panel or “Sub-Panel 1” is used to manage a theme’s page styles and settings. When a sector is selected in the main panel it is used to manage styles for the selected sector and the row the selected sector is contained in. 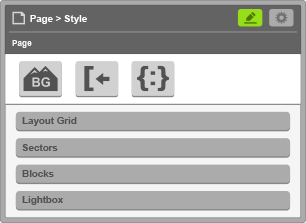 Page Style – Click the Page Style button to view and/or manage all page style rules and groups in the first sub-panel. 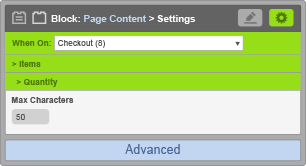 Page Settings – Click the Page Settings button to view and/or manage all page settings. Favicon – Use the Favicon settings to select or upload and apply a custom favicon. 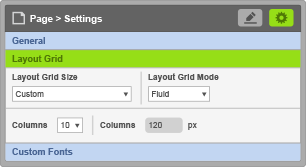 Layout Grid Size – Use the Layout Grid Size setting to set the size of the grid including the layout grid mode, as well as column widths and the number of columns (ie. 960px, 12 Columns @ 80px). 960px, 12 Columns @ 80px (default): Sets the layout grid size to 960px, the number of columns to 12 and the column width to 80px. 100%, 10 Columns @ 10%: Sets the layout grid size to 100%, the number of columns to 10 and the column width to 10%. 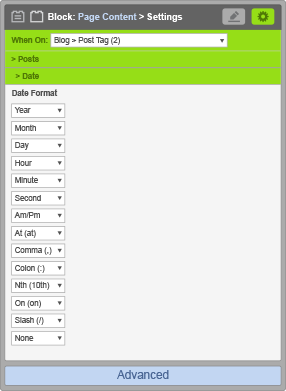 Custom: Sets the layout grid size to custom allowing the number of columns and column width to be customized. Layout Grid Mode – Specifies the mode of the layout grid. Shrink Wrap: Sets the width of the rows equal to the width of the layout grid size (ie. 960px). Fluid: Sets the width of the rows equal to the width of the viewport (ie. 100%). Columns – Specifies the number of grid columns when using the custom layout grid size. Coumn Width – Specifies the width of each grid column when using the custom layout grid size. Custom Fonts – Specifies the custom fonts that have been added or that can be modified. You have not added any custom fonts. (default): No custom fonts have been added. Add Custom Font – Specifies the custom font to add. Modify Custom Font – Specifies the custom font to modify. Sector Style – Select a sector in the main panel to display the sector style view in the first subpanel and to view and/or manage all sector style rules and groups for the selected sector. Go To Row – Click the Go To Row icon to view and/or manage all row style rules for the row containing the selected sector. 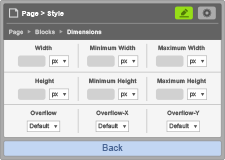 The blocks group in sector styles controlls block styles for all blocks contained in a single sector. 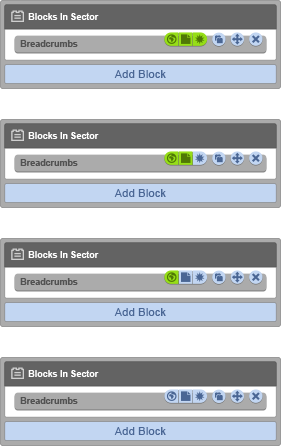 These styles will be added to any existing or new blocks added to the sector. Row Style – Select a sector in the main panel to display the sector style view in the first subpanel and to view and/or manage all sector style rules for the selected row. Go To Sector – Click the Go To Sector icon to go back to the sector style view. When a sector is selected in the main panel the second sub-panel or “Sub-Panel 2” is used to add blocks to the selected sector and manage block styles and settings. When a block has been added to a sector it is used to control block visibility, as well as to copy, move and delete blocks. 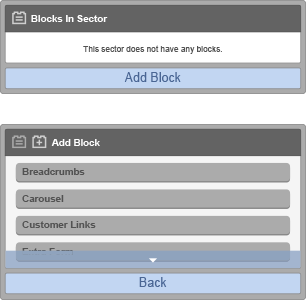 Blocks in Sector – Select a sector in the main panel to display the second sub-panel and add a new block to the selected sector and/or view existing blocks in a sector. “This sector does not have any blocks.” is displayed by default. 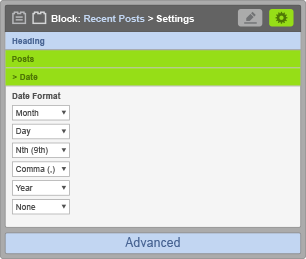 If multiple blocks have been added, drag a block up or down in the list to organize the block order. The order of blocks determines the display order of the blocks in the selected sector. 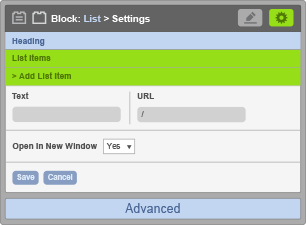 Add Block – Click the Add Block link to display a list of blocks that can be added to the selected sector. Select a block in the block list to add the block to the selected sector. 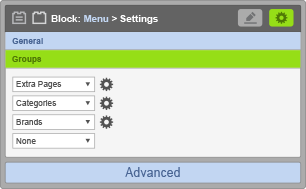 The block settings can be configured before adding the block or after the block has already been added. Note: Blocks marked with an (*) indicate blocks that are used to dynamically pull data that’s been entered within their corresponding sections in the Administrator (ie. Featured Products will display products that have been created in the Admin that are marked as “Featured”). 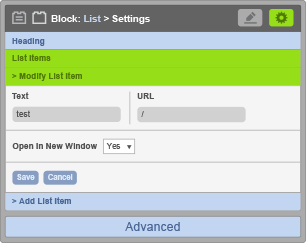 Blocks are easily added by selecting the desired block in the “Add Block” list. Once selected the settings for the disired block are configured before the block is added to the sector. If Add is selected prior to configuring the settings, the block will be added with the default settings. 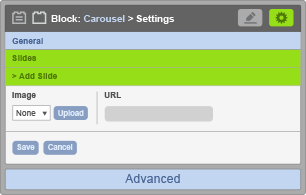 Add – Click the Add link to add the selected block to the selected sector. Back – Click the Back link to go back to the add block view without adding the block. 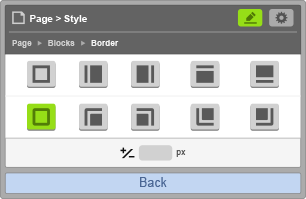 Blocks can easily be adjusted and moved around the theme builder. Below are the different controls to do so. Blocks are set to display globally on every page when first added. 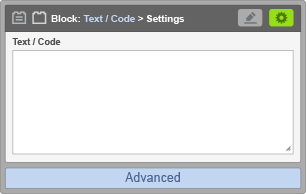 Copy Block – Click the Copy Block icon to copy the block in the selected sector. Copying a block will also copy any block styles and settings that have been applied. Move Block – Click the Move Block icon and select an existing sector in the main panel to move the block to that sector. Moving a block will also move any block styles and setting that have been applied. Delete Block – Click the Delete Block icon to delete the block. Deleting a block will also delete any styles and settings that have been applied to the block being deleted. Visible On This Page – Deselect the Visible On This Page icon to make the block hidden on the current page. Select the icon to change the block back to being visible on the current page. Visible Globally – Deselect the Visible Globally icon to make the block hidden on all pages. 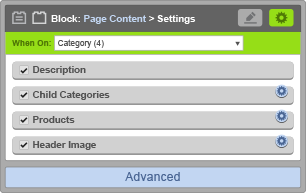 Select the icon to change the block back to being visible on all pages. Visible On This Page Type – Deselect the Visible On This Page Type icon to make the block hidden on all similar page type layouts. 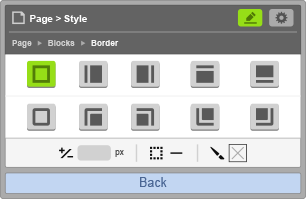 Select the icon again to change the block back to being visible on the current Page Type. 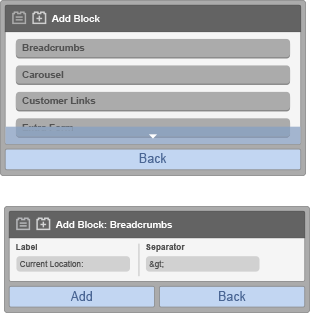 Block Styles – Select a block in the blocks in sector view to view and/or manage all block style rules and groups for the selected block. 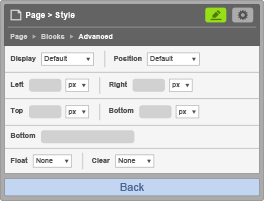 The style options are dynamic and based off the selected block type. Go To Blocks In Sector – Click the Go To Blocks In Sector button to go back to the blocks in sector view and view existing sector blocks and/or add a block to the selected sector. 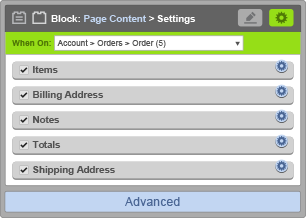 Block Settings – Click the Block Settings button to view and/or manage all block settings for the selected block. 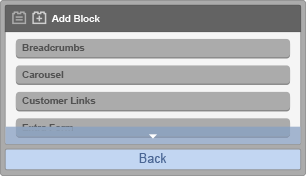 Block settings, just like style controls, will vary based off the selected block type. 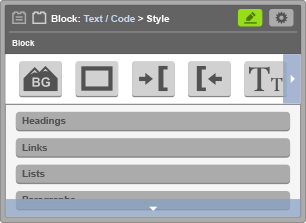 Block Style – Click the Block Style button to go back to the block style view. 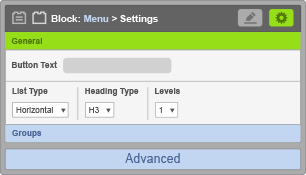 Advanced Settings – Click the Advanced Settings link to view and/or manage the Custom ID and/or Custom Class for the selected block. A key aspect of mastering the Warhead Theme Builder is understanding how the Grid System works within Warhead. The Grid System is the foundation of every website design, allowing for the overall structure and layout of any web design to be easily created. Layout Grid – The Layout Grid or “grid container” is the containing element or “wrapper” that holds all of the elements of the grid including the grid columns and rows, and sector cells and/or areas. Grid Row – A grid row is one complete horizontal group of sector cells. 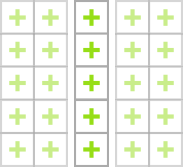 Multiple sectors can be included in a single row, up to a maximum equal to the number of columns in the grid. 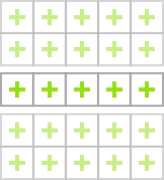 The height of each grid row is determined automatically based on the height of the tallest element within the row. Grid Column – A grid column is on complete vertical group of sector cells. Multiple sectors can be included in a single column. 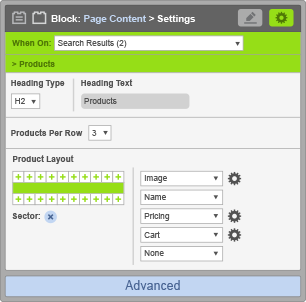 The width of each grid column is determined by the Layout Grid Size settings or by setting the Column Width when using the Custom Layout Grid Size option. 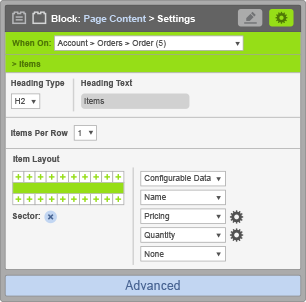 The number of grid columns is determined by the Layout Grid Size settings or by setting the Columns when using the Custom Layout Grid Size option. Sector Cell – A Sector cell is the intersecting cell between a grid column and a grid row. It is the smallest available unit within the grid. The width is determined by grid column width and the height is determined by the row height. Any single grid cell is also considered a Sector area. Sector Area – A Sector area is any area of rectangular space within the grid. A Sector area can contain any number of adjacent sector cells, it can include multiple columns and rows. Blocks are pre-created common elements used in the design and layout as well as functionality of every website. They allow for complex elements to quickly be added by the click of a button and also include many elements that utilize content created in the Warhead Dashboard allowing for seemless edits and changes to the content of the website without having to go into the Theme Builder. Breadcrumbs – Adds a “trail or path” of breadcrumb links that help users keep track of their location as they navigate between pages on the site (ie. Home > Parent Category > Sub Category). The page’s name is used to generate the text for each link. The path is determined based on a page’s parent/child organization. Label – Sets the text that precedes the breadcrumb link path. Text Value (default Current Location:): Specifies the text that displays before the breadcrumb(s). Separator – Sets the text that precedes the breadcrumb link path. Text Value (default > or >): Specifies the text that displays between each breadcrumb. Adds a carousel or “slider” that can be used to display a series of image based content items that slide vertically or horizontally from one to another, one at a time (ie. news headlines, testimonials, popular categories, product offers, etc.). Type – Sets the direction that the slides will scroll. Image Max Width – Sets the maximum width of each slide. Image Max Height – Sets the maximum height of each slide. Previous Button Text – Sets the text for the previous button. Next Button Text – Sets the text for the previous button. 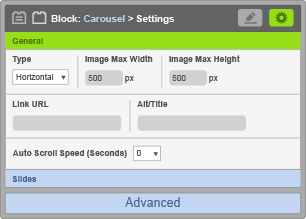 Auto Scroll Speed (Seconds) – Specifies the speed at which the slides scroll in seconds. Slides – Specifies the slides that have been added or that can be modified. Name of file selected for carousel slide: Double click to edit slide or drag and drop above or below another slide to adjust the order. “x” Removes the slide. Image – Sets the image for a slide. URL – The URL for the slide link to. Save – Adds the slide to the list of slides or saves edits made to an existing slide. Adds a group of links that e-commerce store customers commonly use to manage their account at an online store (ie. logging in/out, creating an account, tracking order history, etc.). Show Cart Info – Specifies whether the cart info will be shown. Yes (default): The cart link will be appended to the customer links. No: No cart link will be shown. Show Blog Info – Specifies whether the blog info will be shown. Yes (default): The blog link will be appended to the customer links. No: No blog link will be shown. Adds a form element (ie. < form>, < input>, < select>, etc.) containing various custom form fields (ie. single/multiple line text fields, single/multiple selection fields, etc.) that can be used to collect information that is entered in and submitted by users on the site (ie. contact us form, email subscription form, etc.). Extra Forms can be created and managed in the Admin under Dashboard > Content > Extra Forms. Show Cart Info – Specifies the type of heading that precedes the form. H1: Sets the heading type to an H1 heading. H2 (default): Sets the heading type to an H2 heading. H3: Sets the heading type to an H3 heading. H4: Sets the heading type to an H4 heading. H5: Sets the heading type to an H5 heading. H6: Sets the heading type to an H6 heading. Heading Text – Sets the text for the form heading. Text Value (default none): Specifies the text that displays for the form heading. Extra Form – Specifies the specific form to display. 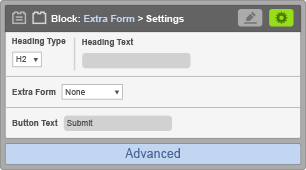 None (default): No extra form will be displayed. Form Name: The name of the extra form to be displayed. Button Text – Sets the text for the form button. Text Value (default Submit): Specifies the text that displays within the form button. Adds functionality to dynamically display a group of products that have been set as “Featured”. Featured Products can be set and managed in the Admin under Dashboard > Store > Products. Heading Type – Specifies the type of heading that precedes the product results. Heading Text – Sets the text for the products heading. Text Value (default Featured Products): Specifies the text that displays for the products heading. Adjust and customize how you would like different product elements to display for the products shown in the Featured Products Block. Max Products – Sets the maximum number of products to display. Text Value (default 12): Specifies the maximum number of featured products to display. 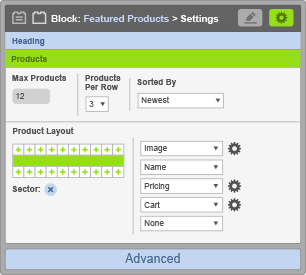 Products Per Row – Specifies the number of products to display per row. 1: Sets the number of products to display per row to 1. 2: Sets the number of products to display per row to 2. 3 (default): Sets the number of products to display per row to 3. 4: Sets the number of products to display per row to 4. Sorted By – Specifies how the products are sorted by default. Newest (default): Sets the default product sorting to display newest products first. Name: A to Z: Sets the default product sorting to display alphabetically by name from A to Z. Name: Z to A: Sets the default product sorting to display alphabetically by name from Z to A. Price: Low to High: Sets the default product sorting to display lowest priced products first. Price: High to Low: Sets the default product sorting to display highest priced products first. Product Layout – Specifies the layout for the product elements. Nested Grid: Sets the grid layout that the product elements are displayed in. Image Max Width – Sets the maximum width of each product image. Pixel Value (default 100px): Specifies the maximum width of each product image in PX (ie. 100px). Image Max Height – Sets the maximum height of each product image. 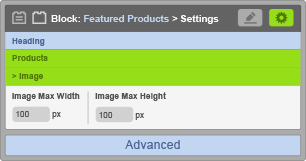 Pixel Value (default 100px): Specifies the maximum height of each product image in PX (ie. 100px). Price Label Text – Sets the text that precedes the product price. Text Value (default none): Specifies the text that displays before the product price. Discount Price Label Text – Sets the text that precedes the product discount price. Text Value (default none): Specifies the text that displays before the discount product price. Free Shipping Text – Sets the text for products with free shipping. 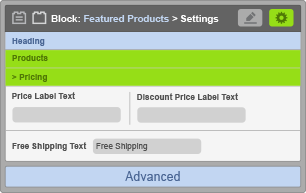 Text Value (default Free Shipping): Specifies the text that displays for products with free shipping enabled. Text Value (default Add to Cart): Specifies the text that displays within the add button. Text Value (default 50): Specifies the maximum number of characters to display for the short description. Adds functionality to dynamically display various groups of gallery files on the site. Galleries can be created and managed in the Admin under Dashboard > Content > Galleries. Heading Type – Specifies the type of heading that precedes the gallery. Heading Text – Sets the text for the gallery heading. Text Value (default none): Specifies the text that displays for the gallery heading. 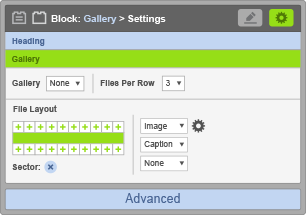 Adjust and customize how you would like different Gallery elements to display for the files shown in the Gallery Block. Gallery – Specifies the specific gallery to display. None (default): No gallery will be displayed. Gallery Name: The name of the gallery to be displayed. Files Per Row – Specifies the number of files to display per row. 1: Sets the number of files to display per row to 1. 2: Sets the number of files to display per row to 2. 3 (default): Sets the number of files to display per row to 3. 4: Sets the number of files to display per row to 4. File Layout – Specifies the layout for the gallery elements. Nested Grid: Sets the grid layout that the gallery elements are displayed in. Image Max Width – Sets the maximum width of each gallery image. Pixel Value (default 100px): Specifies the maximum width of each gallery file in PX (ie. 100px). Image Max Height – Sets the maximum height of each gallery image. Pixel Value (default 100px): Specifies the maximum height of each gallery file in PX (ie. 100px). This element does not have any standard settings. (default): No standard settings are available. Adds an image element (ie. ) that can be used to upload a custom image (ie. a logo, image banner, etc.). Image – Sets the image to use. None (default): No image will be displayed. Image File: The file to use for the image. Link URL – Sets the URL for the link to the image. None (default): The image will not be linked to any URL. URL: The URL to link the image to. Alt/Title – Sets the Alt/Title text for the image. Text Value (none default): Specifies the text that displays for the image on mouse hover. Max Width – Sets the maximum width of the image. None (default): The browser automatically calculates the width of the image. Pixel Value: Specifies the maximum width of the image in PX (ie. 0px). Max Height – Sets the maximum height of the image. None (default): The browser automatically calculates the height of the image. Pixel Value: Specifies the maximum height of the image in PX (ie. 0px). Adds a list element (ie. < ul>, < ol>, and < li>’s) that can be used to enter custom text-based content to display list items (< li>) vertically or horizontally in a bulleted (unordered < ul>) or numbered (ordered < ol>) list format. List Type – Specifies whether the list will display vertically or horizontally. Vertical (default): The list will display vertically from top to bottom. Horizontal: The list will display horizontally from left to right. Heading Type – Specifies the type of heading that precedes the list. Text Value (default none): Specifies the text that displays for the list heading. List Items – Specifies the list items that have been added or that can be modified. You have not added any list items. (default): No list items have been added. Name of List Item createed. Double click to edit slide or drag and drop above or below another item to adjust the order. “x” Removes the item. Text – Sets the text for the list item. Text Value (default none): Specifies the text that displays for the list item. URL – Sets the URL for the list item link. None (default): The list item will not be linked to any URL. URL: The URL to link the list item to. Add List Item – Adds the list item to the list of list items. Open In New Window – Specifies whether a list item link will open in a new window. Yes (default): Specifies the list item link will open in a new window/tab. No: Specifies the list item link will open in the current window/tab. Adds various types of “navigation or menu” lists that are commonly used by users to navigate between certain page types on the site (ie. Extra Pages, Categories, Brands). Menu link names and page URLs can be created and managed in the Admin within their respective sections. Button Text – Sets the text for the menu button. 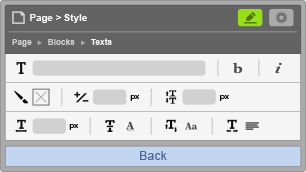 Text Value (default none): Specifies the text that displays within the menu button. Levels – Specifies the number of list item levels to display. 1 (default): Sets the number of list item levels to display to 1. 2: Sets the number of list items levels to display to 2. 3: Sets the number of list item levels to display to 3. Groups – Sets the menu group(s) to display and the order to display them in. None (default): No menu groups will be displayed. Extra Pages: The extra pages menu group will be displayed. Categories: The categories menu group will be displayed. Brands: The brands menu group will be displayed. Heading Text – Sets the text for the menu heading. Text Value (default none): Specifies the text that displays for the extra pages menu heading. Text Value (default none): Specifies the text that displays for the categories menu heading. Text Value (default none): Specifies the text that displays for the brand menu heading. Adds functionality to dynamically display various messages that indicate whether an action was successful or an error was encountered. Messages automatically display on the site when specific actions are completed on a given page (ie. submitting a form, completing an order, etc.). For the best possible user experience, the Messages block should be added to all layouts. This block does not have any standard settings. (default): No standard settings are available. Adds functionality to dynamically display various custom page content on the site. 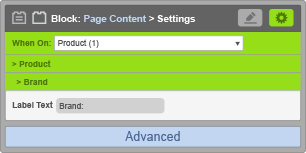 Page Content can be created and managed in the Admin under Dashboard > Content > Core Pages and Dashboard > Content > Extra Pages. When On – Specifies the content that is displayed when on a specific page or page type. Index: Sets the page content to display on the Index page and the order it is displayed in. 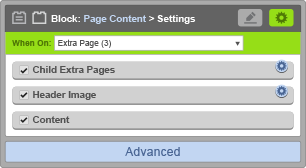 Extra Page: Sets the page content to display on Extra Page pages and the order it is displayed in. 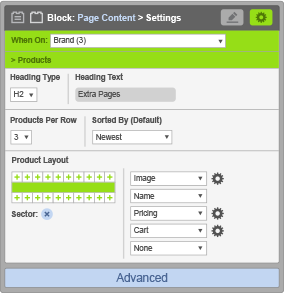 Brand: Sets the page content to display on Brand pages and the order it is displayed in. Category: Sets the page content to display on Category pages and the order it is displayed in. 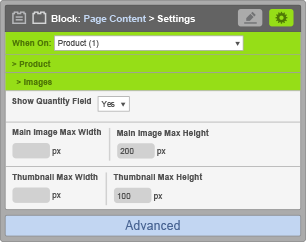 Product: Sets the page content to display on Product pages and the order it is displayed in. Product Tag: Sets the page content to display on Product Tag pages and the order it is displayed in. 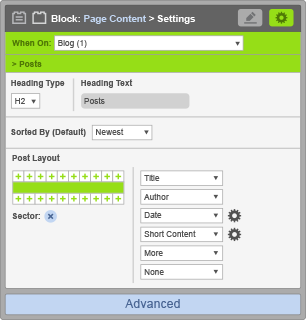 Blog: Sets the page content to display on the Blog page and the order it is displayed in. Blog > Post: Sets the page content to display on Post pages and the order it is displayed in. Blog > Post Tag: Sets the page content to display on Post Tag pages and the order it is displayed in. Search Results: Sets the page content to display on the Search Results page and the order it is displayed in. 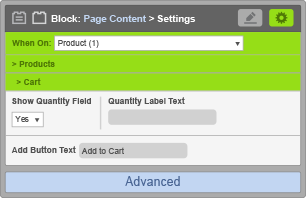 Checkout: Sets the page content to display on the Checkout page and the order it is displayed in. Checkout > Order Complete: Sets the page content to display on the Order Complete page and the order it is displayed in. Log In: Sets the page content to display on the Log In page and the order it is displayed in. Reset Password: Sets the page content to display on the Reset Password page and the order it is displayed in. Create Account: Sets the page content to display on the Create Account page and the order it is displayed in. Account: Sets the page content to display on the Account page and the order it is displayed in. Account > Change Password: Sets the page content to display on the Change Password page and the order it is displayed in. Account > Address Book: Sets the page content to display on the Address Book page and the order it is displayed in. Account > Orders: Sets the page content to display on the Orders page and the order it is displayed in. 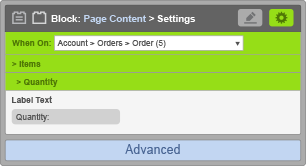 Account > Orders > Order: Sets the page content to display on Order pages for customers and the order it is displayed in. 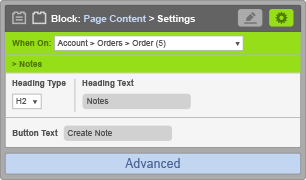 Account > Orders > Order > Create Note: Sets the page content to display on the Create Note page and the order it is displayed in. Track Order: Sets the page content to display on the Track Order page and the order it is displayed in. Track Order > Order: Sets the page content to display on Order pages for customers and guests and the order it is displayed in. This page does not have any page content to add. (default): No page content has been added. Name of Custom Content – Will display any custom content added to the index page in the Admin under Dashboard > Content > Core Pages > Index. These will not have any settings. Child Extra Pages – Specifies whether to display the Child Extra Pages content. Toggled Off (default): The Child Extra Pages content will not be displayed on Extra Page pages. Toggled On: The Child Extra Pages content will be displayed on Extra Page pages. Header Image – Specifies whether to display the Header Image content. Toggled Off (default): The Header Image content will not be displayed on Extra Page pages. 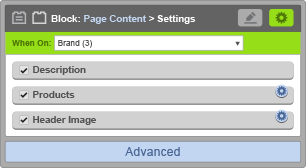 Toggled On: The Header Image content will be displayed on Extra Page pages. Content – Specifies whether to display the Content content. Toggled Off (default): The Content content will not be displayed on Extra Page pages. Toggled On: The Content content will be displayed on Extra Page pages. This page content does not have any standard settings. (default): No standard settings are available. Heading Type – Specifies the type of heading that precedes the pages list. Heading Text – Sets the text for the child pages heading. Text Value (default Extra Pages): Specifies the text that displays for the child pages heading. Max Width – Sets the maximum width of the header image. None (default): The browser automatically calculates the width of the header image. Pixel Value: Specifies the maximum width of the header image in PX (ie. 0px). Max Height – Sets the maximum height of the header image. None (default): The browser automatically calculates the height of the header image. 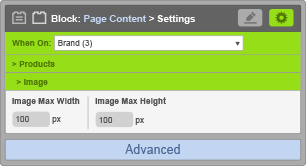 Pixel Value: Specifies the maximum height of the header image in PX (ie. 0px). Description – Specifies whether to display the Description content. Toggled Off (default): The Description content will not be displayed on Brand pages. Toggled On: The Description content will be displayed on Brand pages. Products – Specifies whether to display the Products content. Toggled Off (default): The Products content will not be displayed on Brand pages. Toggled On: The Products content will be displayed on Brand pages. Toggled Off (default): The Header Image content will not be displayed on Brand pages. Toggled On: The Header Image content will be displayed on Brand pages. Heading Type – Specifies the type of heading that precedes the products results. Text Value (default Products): Specifies the text that displays for the products heading. Sorted By (Default) – Specifies how the products are sorted by default. Add Button Text – Sets the text for the add button. Discounted Price Label Text – Sets the text that precedes the product discount price. 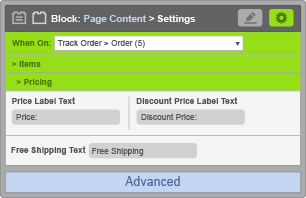 Text Value (default none): Specifies the text that displays before the product discount price. Short Description Max Characters – Specifies the maximum number of characters to display. Toggled Off (default): The Description content will not be displayed on Category pages. Toggled On: The Description content will be displayed on Category pages. Child Categories – Specifies whether to display the Child Categories content. Toggled Off (default): The Child Categories content will not be displayed on Category pages. Toggled On: The Child Categories content will be displayed on Category pages. Toggled Off (default): The Products content will not be displayed on Category pages. Toggled On: The Products content will be displayed on Category pages. Toggled Off (default): The Header Image content will not be displayed on Category pages. Toggled On: The Header Image content will be displayed on Category pages. Heading Type – Specifies the type of heading that precedes the categories list. Heading Text – Sets the text for the child categories heading. Text Value (default Categories): Specifies the text that displays for the child categories heading. Text Value (default Extra Pages): Specifies the text that displays for the products heading. Nested Grid: Sets the grid layout that the product elements are displayed in . Nested Product Elements – There are several elements available to fully customize how products and their information is displayed. The list of the available elements is below. Label Text – Sets the text that precedes the brand link. Text Value (default Brand:): Specifies the text that displays before the brand link. Show Quantity Field – Specifies whether the quantity field will be displayed. Yes (default): The quantity field will be displayed. No: The quantity field will not be displayed. Quantity Label Text – Sets the text that precedes the quantity field. Text Value (default Quantity:): Specifies the text that displays before the quantity field. Heading Text – Sets the text for the category pages heading. Text Value (Categories): Specifies the text that displays for the categories heading. Upload Link Text – Sets the text for the upload link. Text Value (default Click to Upload): Specifies the text that displays for the upload link. Enable Thumbnail Hover – Specifies whether the thumbnails will replace the main image on mouse hover. Yes (default): The thumbnails will automatically replace the main image on mouse hover. No: The thumbnails will not replace the main image on mouse hover. Main Image Max Width – Sets the maximum width of the main product image. Pixel Value (default none): Specifies the maximum width of the main product image in PX (ie. 0px). Main Image Max Height – Sets the maximum height of the main product image. 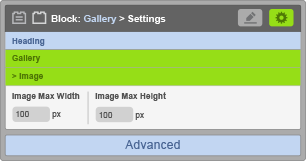 Pixel Value (default 200px): Specifies the maximum height of the main product image in PX (ie. 200px). Thumbnail Max Width – Sets the maximum width of each product thumbnail. Pixel Value (default none): Specifies the maximum width of each product thumbnail in PX (ie. 0px). Thumbnail Max Height – Sets the maximum height of each product thumbnail. Pixel Value (default 100px): Specifies the maximum height of each product thumbnail in PX (ie. 100px). Max Characters – Specifies the maximum number of characters to display. Label Text – Sets the text that precedes the SKU. Text Value (default SKU:): Specifies the text that displays before the SKU. Heading Type – Specifies the type of heading that precedes the tags list. Heading Text – Sets the text for the tags heading. Text Value (default Tags): Specifies the text that displays for the tags heading. Toggled Off (default): The Description content will not be displayed on Product Tag pages. Toggled On: The Description content will be displayed on Product Tag pages. Posts – Specifies whether to display the Posts content. Toggled Off (default): The Posts content will not be displayed on the Blog page. Toggled On: The Posts content will be displayed on the Blog page. Heading Type – Specifies the type of heading that precedes the posts list. Heading Text – Sets the text for the posts heading. Text Value (default Posts): Specifies the text that displays for the posts heading. Newest (default): Sets the default post sorting to display newest posts first. Title: A to Z: Sets the default post sorting to display alphabetically by title from A to Z. Title: Z to A: Sets the default post sorting to display alphabetically by title from Z to A. Post Layout – Specifies the layout for the post elements. Nested Grid: Sets the grid layout that the post elements are displayed in. Short Content Max Characters – Specifies the maximum number of characters to display. Text Value (default 100): Specifies the maximum number of characters to display for the short content. Date Format – Sets the format for post dates and the order to display them in. Year (used in default format): The full year will be used in the post date format. Month (used in default format): The full month of year will be used in the post date format. Day (used in default format): The day of month will be used in the post date format. Hour: The hour of day will be used in the post date format. Minute: The minute of hour will be used in the post date format. Second: The second of minute will be used in the post date format. Am/Pm: Either Am or Pm will be used in the post date format. At (at): The text “at” will be used in the post date format. Comma (,) (used in default format): The comma symbol will be used in the post date format. Colon (:): The colon symbol will be used in the post date format. Nth (26th) (used in default format): Either st, nd, rd or th will be used in the post date format. On (on): The text “on” will be used in the post date format. Slash (/): The slash symbol will be used in the post date format. Image Max Width – Sets the maximum width of each post image. Pixel Value (default 100px): Specifies the maximum width of the post image in PX (ie. 100px). Image Max Height – Sets the maximum height of each post image. Pixel Value (default 100px): Specifies the maximum height of the post image in PX (ie. 100px). More Link Text – Sets the text for the more link. Text Value (default Read More): Specifies the text that displays for the more link. Toggled Off (default): The Posts content will not be displayed on the Post page. Toggled On: The Posts content will be displayed on the Post page. Nested Post Elements – There are several elements available to fully customize how posts and their information is displayed. The list of the available elements is below. Pixel Value (default none): Specifies the maximum width of the post image in PX (ie. 100px). Toggled Off (default): The Description content will not be displayed on Post Tag pages. Toggled On: The Description content will be displayed on Post Tag pages. Posts – Specifies whether to display the Post content. Toggled Off (default): The Posts content will not be displayed on the Post Tag page. Toggled On: The Posts content will be displayed on the Post Tag page. Sorted By (Default) – Specifies how the posts are sorted by default. Narrow Results – Specifies whether to display the Narrow Results content. Toggled Off (default): The Narrow Results content will not be displayed on the Search Results page. Toggled On: The Narrow Results content will be displayed on the Search Results page. Posts – Specifies whether to display the Products content. Toggled Off (default): The Products content will not be displayed on the Search Results page. Toggled On: The Products content will be displayed on the Search Results page. Heading Type – Specifies the type of heading that precedes the narrow list. Heading Text – Sets the text for the results heading. Text Value (default Narrow Results): Specifies the text that displays for the narrow results heading. Pixel Value (default 100px): Specifies the maximum width of the product image in PX (ie. 100px). 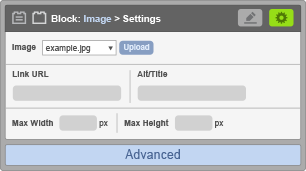 Pixel Value (default 100px): Specifies the maximum height of the product image in PX (ie. 100px). Checkout Method – Specifies whether to display the Checkout Method content. Toggled Off (default): The Checkout Method content will not be displayed on the Checkout page. Toggled On: The Checkout Method content will be displayed on the Checkout page. Items – Specifies whether to display the Items content. Toggled Off (default): The Items content will not be displayed on the Checkout page. Toggled On: The Items content will be displayed on the Checkout page. Billing Address – Specifies whether to display the Billing Address content. 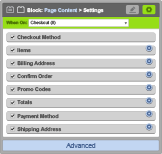 Toggled Off (default): The Billing Address content will not be displayed on the Checkout page. Toggled On: The Billing Address content will be displayed on the Checkout page. Confirm Order – Specifies whether to display the Confirm Order content. Toggled Off (default): The Confirm Order content will not be displayed on the Checkout page. Toggled On: The Confirm Order content will be displayed on the Checkout page. Promo Codes – Specifies whether to display the Promo Codes content. Toggled On: The Promo Codes content will be displayed on the Checkout page. Totals – Specifies whether to display the Totals content. Toggled Off (default): The Totals content will not be displayed on the Checkout page. Toggled On: The Totals content will be displayed on the Checkout page. Payment Method – Specifies whether to display the Payment Method content. Toggled Off (default): The Payment Method content will not be displayed on the Checkout page. Toggled On: The Payment Method content will be displayed on the Checkout page. Shipping Address – Specifies whether to display the Shipping Address content. 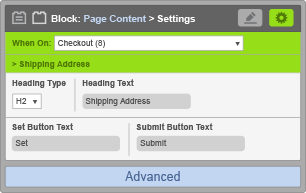 Toggled Off (default): The Shipping Address content will not be displayed on the Checkout page. Toggled On: The Shipping Address content will be displayed on the Checkout page. Heading Type – Specifies the type of heading that precedes the item results. Heading Text – Sets the text for the items heading. Text Value (default Items): Specifies the text that displays for the items heading. Items Per Row – Specifies the number of items to display per row. 1: Sets the number of items to display per row to 1. 2: Sets the number of items to display per row to 2. 3 (default): Sets the number of items to display per row to 3. 4: Sets the number of items to display per row to 4. 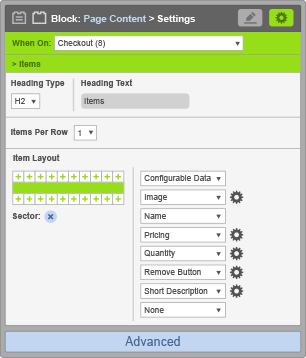 Item Layout – Specifies the layout for the item elements. Nested Grid: Sets the grid layout that the item elements are displayed in. Image Max Height – Sets the maximum width of each product image. Label Text – Sets the text that precedes the quantity field. Text – Sets the text for the remove button. Text Value (default Remove): Specifies the text that displays within the remove button. Heading Type – Specifies the type of heading that precedes the billing address. Heading Text – Sets the text for the billing address. Text Value (default Items): Specifies the text that displays for the billing address heading. Set Button Text – Sets the text for the set button. Text Value (default Set): Specifies the text that displays within the set button. Submit Button Text – Sets the text for the submit button. Text Value (default Submit): Specifies the text that displays within the submit button. Button Text – Sets the text for the confirm order button. Text Value (default Confirm Order): Specifies the text that displays within the confirm order button. Enter a promo code to apply any discounts... (default): Specifies the text that displays before the promo codes form label. Label Text – Sets the text that precedes the promo codes form. Text Value (default Promo Code:): Specifies the text that displays before the promo codes form input. Button Text – Sets the text for the promo codes button. 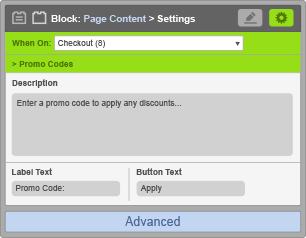 Text Value (default Apply): Specifies the text that displays within the promo codes button. Heading Type – Specifies the type of heading that precedes the totals list. H2: Sets the heading type to an H2 heading. H3 (default): Sets the heading type to an H3 heading. Heading Text – Sets the text for the totals heading. Text Value (default none): Specifies the text that displays for the totals heading. List Each Additional Discount – Specifies whether each additional discount will be displayed. No (default): The additional discount(s) will not be displayed in the totals lists. Yes: The additional discount(s) will be displayed in the totals list. Heading Type – Specifies the type of heading that precedes the payment method. Heading Text – Sets the text for the payment method. Text Value (default none): Specifies the text that displays for the payment method heading. Heading Type – Specifies the type of heading that precedes the shipping address. Heading Text – Sets the text for the shipping address. Text Value (default none): Specifies the text that displays for the shipping address heading. Name of Custom Content – Will display any custom content added to the Order Complete page in the Admin under Dashboard > Content > Core Pages > Checkout > Order Complete. These will not have any settings. Form – Specifies whether to display the Form content. Toggled Off (default): The Form content will not be displayed on the Log In page. Toggled On: The Form content will be displayed on the Log In page. Toggled Off (default): The Form content will not be displayed on the Reset Password page. Toggled On: The Form content will be displayed on the Reset Password page. Toggled Off (default): The Form content will not be displayed on the Create Account page. Toggled On: The Form content will be displayed on the Create Account page. Toggled Off (default): The Form content will not be displayed on the Account page. Toggled On: The Form content will be displayed on the Account page. Links – Specifies whether to display the Links content. Toggled Off (default): The Links content will not be displayed on the Account page. Toggled Off (default): The Form content will not be displayed on the Change Password page. Toggled On: The Form content will be displayed on the Change Password page. Addresses – Specifies whether to display the Addresses content. Toggled Off (default): The Addresses content will not be displayed on the Address Book page. Toggled On: The Addresses content will be displayed on the Address Book page. Heading Text – Sets the text for the addresses heading. Text Value (default Items): Specifies the text that displays for the addresses heading. Toggled Off (default): The Form content will not be displayed on the Create Address page. Toggled On: The Form content will be displayed on the Create Address page. Orders – Specifies whether to display the Orders content. Toggled Off (default): The Orders content will not be displayed on the Orders page. Toggled On: The Orders content will be displayed on the Orders page. Heading Type – Specifies the type of heading that precedes the orders list. Heading Text – Sets the text for the orders heading. Text Value (default Items): Specifies the text that displays for the orders heading. 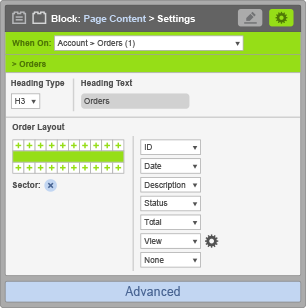 Order Layout – Specifies the layout for the order elements. View Button Text – Sets the text for the view button. Text Value (default View Order): Specifies the text that displays within the view button. Toggled Off (default): The Items content will not be displayed on the Order page. Toggled On: The Items content will be displayed on the Order page. Toggled Off (default): The Billing Address content will not be displayed on the Order page. Toggled On: The Billing Address content will be displayed on the Order page. Notes – Specifies whether to display the Notes content. Toggled Off (default): The Notes content will not be displayed on the Order page. Toggled On: The Notes content will be displayed on the Order page. Toggled Off (default): The Totals content will not be displayed on the Order page. Toggled On: The Totals content will be displayed on the Order page. Toggled Off (default): The Shipping Address content will not be displayed on the Order page. Toggled On: The Shipping Address content will be displayed on the Order page. Heading Type – Specifies the type of heading that precedes the items list. 1 (default): Sets the number of items to display per row to 1. 3: Sets the number of items to display per row to 3. 5: Sets the number of items to display per row to 5. Price Label Text – Sets the text that precedes the item price. Text Value (default Price:): Specifies the text that displays before the item price. Discount Price Label Text – Sets the text that precedes the item discount price. Text Value (default Discount Price:): Specifies the text that displays before the item discount price. Free Shipping Text – Sets the text for items with free shipping. Text Value (default Free Shipping): Specifies the text that displays for items with free shipping enabled. Heading Text – Sets the text for the billing address heading. Text Value (default Billing Address): Specifies the text that displays for the billing address heading. Heading Type – Specifies the type of heading that precedes the notes form. Heading Text – Sets the text for the notes heading. Text Value (default Billing Address): Specifies the text that displays for the notes heading. Button Text – Sets the text for the notes button. Text Value (default Create Note): Specifies the text that displays within the notes button. Heading Text – Sets the text for the shipping address heading. Toggled Off (default): The Form content will not be displayed on the Create Note page. Toggled On: The Form content will be displayed on the Create Note page. Toggled Off (default): The Form content will not be displayed on the Track Order page. Toggled On: The Form content will be displayed on the Track Order page. Adds a page heading element (ie. < h1>, < h2>, < h3>, etc.) that dynamically displays a page’s name on the site in order to help users and search engines easily identify a page’s subject. Extra page names are set and managed in the Admin. Core page names cannot be customized. Heading Type – Specifies the type of heading to display. Adds functionality to dynamically display a configurable list of the most recent blog posts. 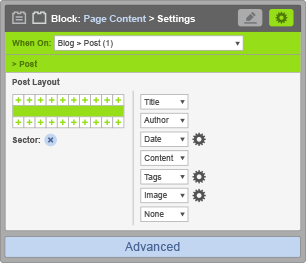 Blog Posts are created and managed in the Admin under Dashboard > Content > Blog > Posts. Description – Specifies the type of heading that precedes the recent posts. Heading Text – Sets the text for the recent posts heading. Text Value (default Recent Posts): Specifies the text that displays for the recent posts heading. 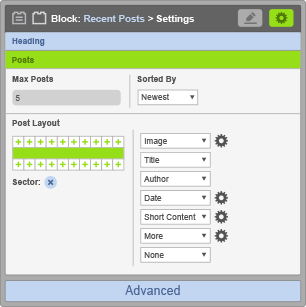 Max Posts – Sets the maximum number of posts to display. 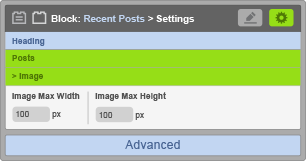 Text Value (default 5): Specifies the maximum number of posts to display. Sorted By – Specifies how the posts are sorted by default. Adds a search form and button elements (ie. < input>, < button>, etc.) that are used to display a group of product results based on a specific keyword (or keywords) entered into the search form by users. Label Text – Sets the text that precedes the search form. Text Value (default Search:): Specifies the text that displays before the search form input. Button Text – Sets the text for the search button. Text Value (default Go): Specifies the text that displays within the search button. Content – Sets the text to display from the Text/Code block. Text Value (default none): Specifies the text that is displayed on the site from the Text/Code block. 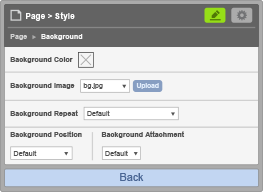 Background Color – Sets the background color of an element. Transparent (default): Specifies that the background color should be transparent. Color Value: Specifies the background color value in HEX (ie. #000000) or RGBA (ie. rgba(0, 0, 0, 1.0). Background Image – Sets the background image for an element. None (default): No background image will be displayed. Image File: The file to use for the background image. Background Repeat – Sets how a background image will be repeated. Repeat (default): The background image will be repeated both vertically and horizontally. Repeat Horizontally Only: The background image will be repeated only horizontally. Repeat Vertically Only: The background image will be repeated only vertically. Don’t Repeat: The background-image will not be repeated. Background Position – Sets the starting position of a background image. 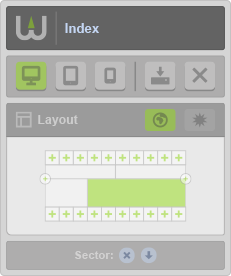 Left Top (default): The background image position will start horizontally at the top and vertically to the left of an element. Left Center: The background image position will start horizontally to the left and vertically at the bottom of an element. Left Bottom: The background image position will start horizontally to the left and vertically at the bottom of an element. Center Top: The background image position will start horizontally at the center and vertically at the top of an element. Center Center: The background image position will start horizontally at the center and vertically at the center of an element. Center Bottom: The background image position will start horizontally at the center and vertically to the bottom of an element. Right Top: The background image position will start horizontally to the right and vertically at the top of an element. Right Center: The background image position will start horizontally to the right and vertically at the center of an element. Right Bottom: The background image position will start horizontally to the right and vertically at the bottom of an element. Background Attachment – Sets whether a background image is fixed or scrolls with the rest of the page. Scroll (default): The background scrolls along with the element. Fixed: The background is fixed with regard to the viewport. Border – Sets the left, right, top and bottom border of an element. Border Width (default 0px): Specifies the width of the border in PX (ie. 0px). Border Style (default none): Specifies the style of the border. Solid: Defines a solid border. Dashed: Defines a dashed border. Dotted: Defines a dotted border. Border Color (default element color): Specifies the color value of the border in HEX (ie. #000000). Left Border – Sets the left border of an element. Right Border – Sets the right border of an element. Top Border – Sets the top border of an element. Bottom Border – Sets the bottom border of an element. Border Radius – Sets the top left, top right, bottom left and bottom right border radius of an element. Pixel Value (default 0px): Specifies the radius of the border in PX (ie. 0px). Top Left Border Radius – Sets the top left border radius of an element. Top Right Border Radius – Sets the top right border radius of an element. Bottom Left Border Radius – Sets the bottom left border radius of an element. Bottom Right Border Radius – Sets the bottom right border radius of an element. Width – Sets the width of an element. Auto (default): The browser automatically calculates the width of an element. Pixel Value: Specifies the width of an element in PX (ie. 0px). Percent Value: Specifies the width of an element in % (ie. 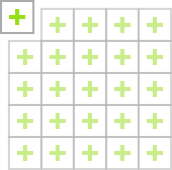 100%) of the containing element. Minimum Width – Sets the minimum width of an element. Pixel Value (default 0px): Specifies the minimum width of an element in PX (ie. 0px). Percent Value: Specifies the minimum width of an element in % (ie. 100%) of the containing element. Maximum Width – Sets the maximum width of an element. Pixel Value (default 0px): Specifies the maximum width of an element in PX (ie. 0px). Percent Value: Specifies the maximum width of an element in % (ie. 100%) of the containing element. Height – Sets the height of an element. Auto (default): The browser automatically calculates the height of an element. Pixel Value: Specifies the height of an element in PX (ie. 0px). Percent Value: Specifies the height of an element in % (ie. 100%) of the containing element. Minimum Height – Sets the minimum height of an element. Pixel Value (default 0px): Specifies the minimum height of an element in PX (ie. 0px). Percent Value: Specifies the minimum height of an element in % (ie. 100%) of the containing element. Maximum Height – Sets the maximum height of an element. Pixel Value (default 0px): Specifies the maximum height of an element in PX (ie. 0px). Percent Value: Specifies the maximum height of an element in % (ie. 100%) of the containing element. Overflow – Specifies whether to clip the left, right, top and bottom content edges or to add scrollbars if content overflows an element’s container. Visible (default): The overflow is not clipped and the rest of the content will be visible. Hidden: The overflow is clipped and the rest of the content will be invisible. Scroll: The overflow is clipped but scrollbars are added to see the rest of the content. Auto: If overflow is clipped scrollbars should be added to see the rest of the content. Overflow-X – Specifies whether to clip the left and right content edges or to add a horizontal scrollbar if content overflows an element’s container. Overflow-Y – Specifies whether to clip the top and bottom content edges or to add a vertical scrollbar if content overflows an element’s container. Opacity – Sets the opacity level for an element. Percent Value: Specifies the opacity level for an element in % (0% is fully transparent, 100% is fully opaque). Content Align – Specifies the horizontal alignment of an element in a container. Left (default): Aligns the element(s) to the left. Right: Aligns the element(s) to the right. Display – Specifies the type of box used for an element. None: The element will not be displayed. Block: Displays an element as a block element (ie. < p>). Inline Block: Displays an element as an inline-level block container. Inline (default): Displays an element as an inline element (ie. < span>). Position – Specifies the type of positioning for an element. Static (default): The element is positioned according to the normal flow of the document. Relative: The element is positioned relative to its normal position. Absolute: The element is positioned relative to its first positioned non- static ancestor element. Fixed: The element is positioned relative to the browser window. Left – Sets the left margin edge for a positioned box. Right – Sets the right margin edge for a positioned box. Top – Sets the top margin edge for a positioned box. Bottom – Sets the bottom margin edge for a positioned box. Z-Index – Specifies whether an element should be stacked in front or behind other elements. Auto (default): Sets the stack order equal to an element’s parents. Number Value: Sets the stack order of the element (ie. 1 or -1). Float – Specifies whether an element should be placed along the left or right side of its container. None (default): The element does not float. Left: The element floats to the left of its container. Right: The element floats to the right of its container. Float – Specifies which sides of an element floating elements are not allowed to float. None (default): Allows floating elements on both sides. Left: No floating elements allowed on the left side. Right: No floating elements allowed on the right side. Both: No floating elements allowed on the left or right side. List Style Type – Specifies the type of list item marker in a list. UL (unordered lists): The list items are marked with bullets. None (default): No list item marker is displayed. Circle: The list item marker is a circle. Disc: The list item marker is a filled circle. Square: The list item marker is a square. OL (ordered lists): The list items are marked with numbers or letters. Decimal: The list item marker is a number (ie. 1,2,3, etc.). Decimal Leading Zero: The list item marker is a number beginning with zeros (ie. 01,02,03, etc.). Lower Alpha: The list item marker is lower case letters (ie. a,b,c, etc.). Lower Roman: The list item marker is lower case roman numerals (ie. i,ii,iii, etc.). Upper Alpha: The list item marker is upper case letters (ie. A,B,C, etc.). Upper Roman: The list item marker is upper case roman numerals (ie. I,II,III, etc.). 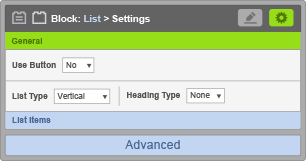 List Style Position – Specifies if the list item markers should appear inside or outside the content flow. Inside: The list item markers appear inside the content flow (indents marker and text). Outside: The list item markers appear outside the content flow (keeps marker left of text). Margin – Sets the left, right, top and bottom margin of an element. Pixel Value (default 0): Specifies the margin of an element in PX (ie. 0px). Left Margin – Sets the left margin of an element. Right Margin – Sets the right margin of an element. 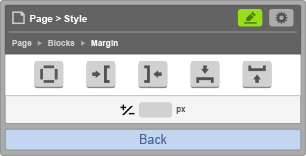 Top Margin – Sets the top margin of an element. Bottom Margin – Sets the bottom margin of an element. Padding – Sets the left, right, top and bottom padding of an element. Pixel Value (default 0): Specifies the padding of an element in PX (ie. 0px). Left Padding – Sets the left padding of an element. 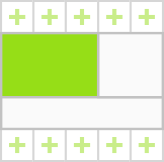 Right Padding – Sets the right padding of an element. Top Padding – Sets the top padding of an element. Bottom Padding – Sets the bottom padding of an element. Font Family – Specifies the font for an element. Family Value: A prioritized list of font family names (ie. Arial, Verdana, Serif, etc.). Font Weight – Sets how thick or thin text characters should be. Normal (default): Defines normal characters. Font Style – Specifies the font style for text. Normal (default): The browser displays a normal font style. Italic: The browser displays an italic font style. Color – Sets the color of text. Color Value: Specifies the color of text in HEX (ie. #000000). Font Size – Sets the size of a font. Pixel Value: Sets the size of a font in PX (ie. 0px). Line Height – Sets the line height of text. Normal (default): Specifies the line height of text to normal. Pixel Value: Specifies the line height of text in PX (ie. 0px). Letter Spacing – Increases or decreases the space between characters in text. Pixel Value: Sets the size of letter spacing in PX (ie. 0px). Text Decoration – Sets the decoration added to text. None (default): Defines a normal text. Underline: Defines a line below the text. Line Through: Defines a line through the text. Text Transform – Sets how text case should be displayed. None (default): The text renders as it is with or without capitalization. Capitalize: Transforms the first character of each word to uppercase. Uppercase: Transforms all characters to uppercase. Lowercase: Transforms all characters to lowercase. Text Align – Specifies the horizontal alignment of text in an element. Left (default): Aligns text to the left. Right: Aligns text to the right. Allows you to easily add any CSS styles that aren’t built into Warhead by default. we will get in touch to help assist further. 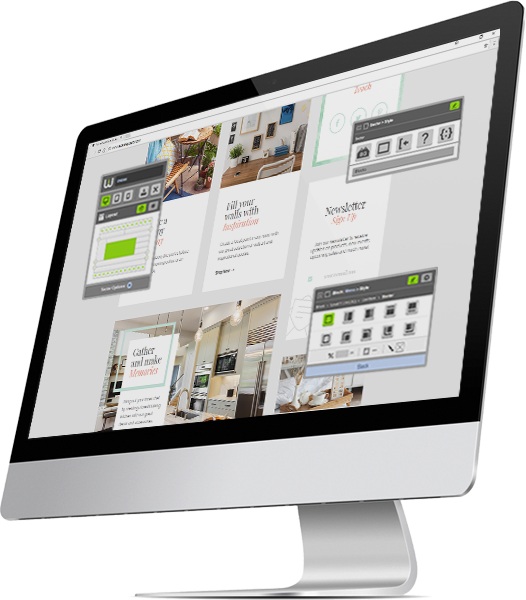 Warhead is a website design tool for professional and student designers that streamlines the web design and development process with built-in theme building, content management, ecommerce and hosting tools all-in-one platform. You can create unlimited sites in Warhead for free. You're only charged when you activate a custom domain name. Once a domain is activated, it's only $15/site per month. Any site without an active domain remains free. Can I create more sites? Yes. You can create unlimited sites. All your sites are easily accessed from the Sites section within your Account. You only need one account to manage everything. Yes. You can add unlimited users. It's easy to add users and manage their permissions. The users you add only have access to the site(s) you assign them to. You can even grant or restrict access to certain sections of each site. You design a site using Warhead's simple visual theme builder. You can create unlimited themes and customize the layout and design of every page on your site. All from your browser in real-time. Yes. You can easily adjust any theme to fit tablet and mobile devices. Just like desktop layouts, everything is visual and you can control the layout and design of every page independently. Yes. You can create unlimited extra pages per site and manage each page's content and data. You can even create forms, galleries, blog posts and manage data for core pages in your site's Content section. Yes. You can add unlimited products, categories and brands, and accept PayPal or credit card payments. Shipping, payment, tax, discounts and much more can all be easily managed in your site's Store section. Yes. Most data can be imported using a .CSV file. Currently, themes, extra pages, posts, products, product variants, post/product tags, customers, customer addresses and orders can all be imported or exported. If you get stuck or need help you can find tutorial videos, user guides and other helpful resources on the Warhead Launchpad (this page) or use the Help section within your Account to view Documents or create a Ticket. We're also available to answer questions or provide assistance via email. To cancel a site you simply need to cancel that site's subscription. Once a subscription is cancelled you will no longer be charged for that site each month. Afterwards, you can even continue to use the site for free on the default domain.